The dramatic ruins at Sillustani are a little over 20 miles northwest of Puno. 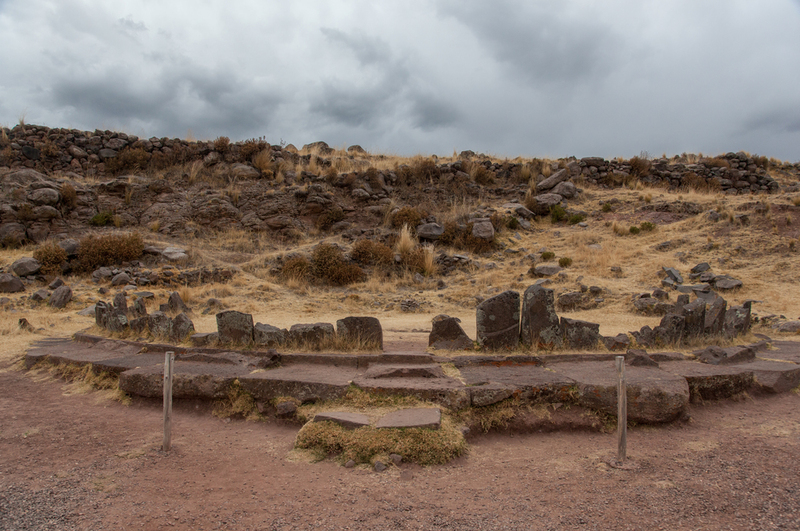 The site consists of a number of funerary towers, or chullpas, that were originally built by the Collas, and ethnically Aymara people that were eventually conquered by the Inca in the 15th century. The Incas continued the tradition of building these towers. The site sits on a peninsula that rises above Lake Umayo. You get to the site by traveling to the small town of Sillustani which sits just to the east of the peninsula. Lake Umayo lies just northwest of Lake Titicaca roughly half way between Puno and Juliaca. Intihuatana, which roughly translates from Quechua to "hitching post of the Sun", are ritual stones that are used to worship and observe the passing of the sun. The most famous example is the Intihuatana at Machu Picchu. On the walk up to the chullpas at Sillustani you walk past this small temple which once housed Sillustani's Intihuatana. Ancestor worship and the preservation of mummies were central to many Andean cultures. The chullpas of Sillustani were where the elite of this region would reside after death. Most of the chullpas contained the remains of multiple individuals and were likely used to preserve and venerate ancestral lineages, or ayllus. The chullpas were also used to assert ethnic identity and territorial control. Isla Umayo, the largest island in Lake Umayo, is now a preserve that is used to protect vicuña, the small, wild relative of the llama. Dating back to Inca times, vicuña have been a protected species. Their very fine, warm wool can only be collected once every three years. Chullpa Lagarto is a partially collapsed tower that shows the rough interior that is located beneath the finely worked exterior. High up on the north side of this tower is a carving of lizard, which gives the tower its name.